This AFP news clip has appeared in several other blogs, but I think it’s worth re-posting it here. It’s so sad to see this. Is this the way our nation treats the people who helped build it? To provide public assistance to all elderly Singaporeans in this situation will be but a drop in the bucket for the government. Instead the criteria for receiving public assistance is that you have to be completely destitute and without any family who can assist you. Despite all the need out there like the old lady in the clip, there are only 3,000 people in the whole of Singapore who are receiving public assistance to the tune of $260 a month. That adds up to $780,000 a month, which is much less than a Minister gets paid in one year. I almost forgot about the total solar eclipse that took place this morning. It was a good thing that when I tuned in to my favourite radio station 933 at 8.15am and the DJs were commenting that the total solar eclipse was about to start and there would be a live telecast on Channel U.
I was feeding my daughter Hannah breakfast and I told myself to quickly finish feeding her so I could watch it on TV. Even though I was not able to experience it in Singapore, it was very amazing to even watch it on TV especially since the program was in Chinese and I appreciate Chinese, programmes more than English ones. I could feel the emotions and excitement through the ‘live’ telecast and I couldn’t help but get excited with them too. It was very magnificent when the sun was completely covered by the moon within a few minutes. It reminded me of the thrill and happiness that I had when I was able to watch the sunset with my husband Gerald outside my flat in Sembawang a few weeks ago. Barack Obama was invited to speak at the graduation ceremony of the University of Notre Dame, where he touched on the contentious issue of abortion. Notre Dame, apart from being known for its football team, is one of the nation’s premier Catholic universities. It was thus very controversial for Obama, a strong advocate of abortion rights, to be invited. The Catholic Church strongly opposes abortion. 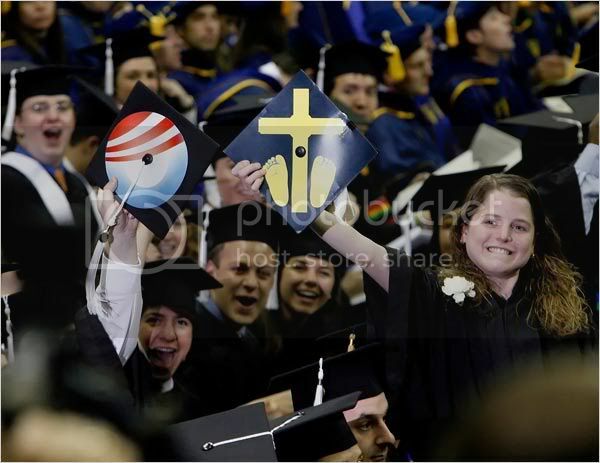 Some students had attended their commencement but stated their stand by wearing anti-abortion symbols on their mortar boards. I oppose the Nominated Member of Parliament (NMP) scheme. It’s name — Nominated MP — already condemns it as undemocratic in nature. An MP is supposed to be a representative of his or her constituency — the candidate who has been given the most votes by his constituents. I am very concerned about reports that a police officer interrogating a murder suspect suggested scenarios to the accused about how he allegedly murdered his wife. When the accused lawyer asked him why he was then able to provide details of the alleged murder in his police statements, the accused said the investigating officer had asked him “would it have happened this way or would it have happened that way?” when he could not answer her questions. “I told her between the two, this looks okay, you can take this, and I wanted to be out of the place as soon as possible because of the coldness,” said the accused. I feel sad to learn that the number of abortions in Singapore increased again last year to 12,222, compared to 11,933 in 2007 and 12,032 in 2006. Prior to 2006, it had been on a decline since 2000. About one in four pregnancies in Singapore is terminated through abortion. In Singapore, pregnancies can legally terminated up to 5 months (24 weeks) into gestation. Singapore has one of the most liberal abortion laws in the world, thanks to the Abortion Act of 1969 and an amended Act of 1974, both of which — especially the second, more liberal law — passed easily in an all-PAP Parliament, despite the Whip being lifted to allow MPs to vote according to their consciences. According to Home Affairs Minister Wong Kan Seng, Mas Selamat Kastari swam across the Straits of Johor using an ‘improvised flotation device’ in his dash to freedom ‘soon after’ his escape from the Whitley Detention Centre on Feb 27 last year. Also, no local Jemaah Islamiah network was involved in aiding Mas Selamat’s dash. In other words, he escaped to Johor all on his own. I presume the Minister got this information from the Malaysian police, who had interrogated the terrorist suspect after arresting him on April 1st. 1. Mas Selamat was reported to have escaped at 4.05pm. Assuming he made a beeline to the northern coast of Singapore, he would have arrived at the coast before sunset. Does this mean that a man rowing himself across the Johor Strait on a self-made raft in broad daylight was not spotted by our Police Coast Guard (PCG)? 2. Wasn’t there a lockdown and all the checkpoints alerted of Mas Selamat’s escape immediately after the escape? If so why was the PCG not able to detect him rowing across the Straits of Johor? Don’t they have sophisticated radar equipment? 3. Was the PCG even alerted in the first place, or was there a communication lapse? Either way, is there going to be an inquiry into this second lapse? 4. The Malaysian Home Minister said Mas Selamat was arrested because he was “planning something”. What were these plans and how would it have affected Singapore? 5. Since the Minister knows how he got across to Johor, I presume he also knows how Mas Selamat actually got out of Whitley Detention Centre through the interrogations. Will he be able to share that information with Singaporeans, particularly if it differs from the Committee of Inquiry’s hypothesis? Mas Selamat captured…all thanks to ISD! Firstly let me state that I am glad that Mas Selamat has been captured. I thank the Malaysian police for their excellent work in capturing the fugitive. Malaysian Home Minister Hishamuddin said that they arrested him under the ISD because he was plotting something, which means they not only caught the JI leader who escaped from under Singapore’s nose, but possibly managed to thwart a planned terrorist attack. I am, however, appalled that the Singapore mainstream media and Home Affairs Minister Wong Kan Seng would go to the extent of congratulating themselves and taking credit for Mas Selamat’s arrest by the Malaysians. Instead of acting with a bit of humility and contrition, the Singapore Government has attempted to turn the tables on their “setback” and praise itself for the re-arrest of the alleged terrorist mastermind. Author Gerald GiamPosted on 8 May 2009 8 May 2009 Categories UncategorizedTags Home Affairs, ISD, Malaysia, Mas Selamat5 Comments on Mas Selamat captured…all thanks to ISD!